Looking for something which can back-up your Blu-ray and DVD movies on your system? If yes, then Leawo Blue-ray Ripper for Windows and Blu-ray Ripper for Mac has been designed to take up your needs depending on the OS you own. It has received quite appreciable ratings from home users as well as professional software editors. The Blu-ray ripper swiftly converts the DVD content into formats like MKS, MP4, MOV, 3GP, AVI, FLV and other formats which are iOS supported as well. Also, all available conversions compatible for Android, smartphone and tablet compatible are available. In all Leawo Blue-ray Ripper supports and offers aout 180+ output formats for multiple devices. The users can customize their profile with respect to video and audio parameters which best supports their devices. 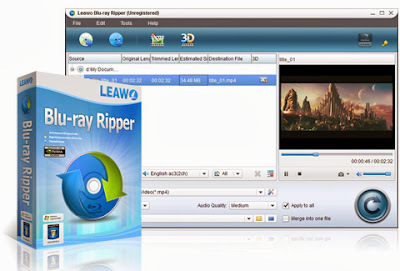 Other features including audio track selection, subtitles, 3D movie creation and video editing are also supported by Leawo Blue-ray Ripper. These might sound just tall claims to you, but Leawo Blu-ray Ripper Win and Mac has come up to what it says. There had been a number of performance review session on the software and it has lived up to its expectations. On testing the performance, testers have come up with the following parameters. In all, Blu-ray ripper is an excellent tool to take care of your conversion needs, with all the available features in excellent for, better performance, high conversion quality , excellent editing and a number of conversion formats with just a little compensation on the conversion speed but that is acceptable. Below you can find a quick video tutorial and learn how to make the most of Blu-Ray Ripper. 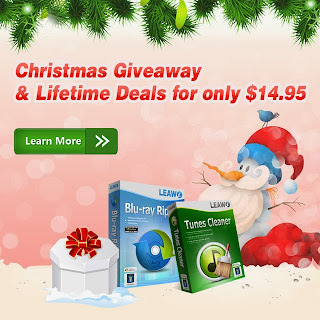 Leawo has decided to give away its Blu-ray ripper in order to celebrate Christmas with all of its supports, users and potential customers. It is also giving lifetime deals on all it's products at exciting prices. The Blu-ray ripper is available both for Windows and Macintosh platforms where one year keycode is available for free and you can also buy lifetime subscription for only $19.95. Along with Blu-ray ripper Leawo is also giving away Tunes Cleaner Win and Mac, which is a professional iTunes cleanup program that detects and deletes duplicate songs, fetches album arts and also downloads and adds music tags like artists’ albums, etc. This giveaway also comes in two forms one is a free one year key code and the full version is available at $14.95 for lifetime. 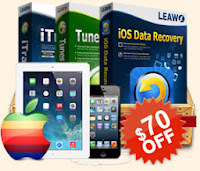 Leawo is also hosting bundle offers which gets you iOS Data Recovery + Tunes Cleaner + iTransfer for just $49.95 which is 70% off on actual price. Also you can get bundle having Total Media Converter Ultimate + Blu-ray Copy + iTransfer for a steal price of $79.95 which is 85% off on actual price. You can also create a custom bundle offer for you and select the software you wish to buy. You won't get such deals on Leawo products any other time. Make the most of these offers and Merry X-mas !